With the Winter Olympics in PyeongChang, South Korea, on the snowy horizon, you might start to feel left out in LA. Not only are the events happening on the other side of the world, but LA hasn’t seen snow since 1962. These winter themed video games are sure to bring you that little bit closer to experiencing snow in LA. If you are experiencing FOMO, or fear of missing out this winter, these video games are sure to give you the chills and bring you closer to the action of this year’s winter Olympics. Starting at $59.99, available on PC, PS4, and Xbox One. Steep Winter Games Edition includes Steep, the massive open world video game that places you at the heart of the Alps, and the Alaskan Mountain ranges. Master these Epic mountains on a snowboard, skis, a wingsuit, or paraglider. Seamlessly meet other players on the mountains, and follow them, or challenge your friends to beat your own personal records, lines, and scores. With the Steep Winter Games expansion, included in the price, you are essentially doubling the size of the game as you explore the legendary Japanese mountains. Train to Qualify for the Olympic Games in PyeongChang, South Korea. Travel throughout the world as you experience what it takes to become an Olympian, as you chase gold in PyeongChang. The world’s leading off-road racing series is back! Dirt 4 puts you in the driver’s seat of some of the most powerful and capable off-road vehicles ever created. Drive over 50 of the most legendary and iconic rally cars ever made, over millions of rally routes in Australia, Spain, Michigan, Sweden, and Wales. While not specifically a winter themed game, a large portion of the game is staged in Sweden, the rally capital of the world. Temperatures drop as low as -22 Fahrenheit in Sweden, these temperatures are sure to make you feel as if you need a sweater for yourself. With dynamic driving physics, will you be able to cope with black ice and snow covered roads? This sandbox game is quickly becoming one of, if not, the most popular game ever created. Released in 2009, this game allows players to create their own worlds and their own experiences. Players use building blocks, and resources that they discover throughout their unique online world. What will you build? A world filled with snow-capped mountains, perhaps? While we can’t control the weather, we can make sure you have fun this winter! Our team here at GameTruck LA seek to host the most exciting and entertaining parties for video game lovers, as well as those who love to run outside in the sun. GameTruck parties deliver the excitement to your door, with video game parties and LaserTag. Fitness is an essential part of your daily life –– it’s recommended you spend 150 minutes a week sweating it out. How do you get your exercise in? Perhaps you go for a run or take dance classes. If you’re like many Americans, you may struggle to get your optimal amount of exercise. 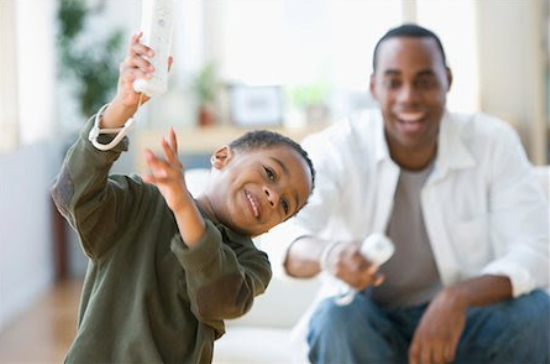 Did you know you can stay active with video games? Gaming may seem like a way to sit back and relax, but you can burn hundreds of calories in front of a console. Wii Fit was introduced a decade ago, and it’s still one of the most popular video games on the market. Players can choose from more than 40 activities, and there are unique options like snowboarding, yoga, and tennis. Some of the high-intensity activities like island running burn 165 calories per 30-minute session. While GameTruck Los Angeles specializes in video game parties, we also offer laser tag parties for up to 12 people. Your party guests will get to play laser tag wherever you please––whether it’s a park, playground or backyard. LaserTag will keep you entertained and engaged, and you’ll burn calories while playing. You don’t need to be a dance expert to have fun playing this game. All that’s required is a willingness to try new dance moves and groove to your favorite songs. Just Dance can be played with your friends or alone, and you’re tasked with mimicking the dance moves you see on-screen. GameTruck Los Angeles is the premier provider of mobile video game parties in the Los Angeles area. We bring the fun to you, and we’ve been in the business for nearly a decade. Click here for a free pricing quote or call 866-253-3191. There’s nothing quite as bothersome as trying to reach someone who can’t be bothered to return your phone calls or emails. Of course, if you’re paying someone for a service, your expectations are even higher. When you’re planning an event, you need vendors who actually care about you, your needs and your party goals. Unfortunately, not every company that claims to have great customer service really follows through. GameTruck Los Angeles is the exception. From the moment you book with us, you’ll have party planning experts at your disposal. Not only do we provide invitations to make sure your guests feel special, but we also have a franchise owner who personally oversees every part of our business. You may even spot him at your party. Our video game parties provide one-of-a-kind fun for people of all ages and backgrounds – even your guests who don’t like games will find themselves having a blast thanks to our innovative setup. You’ll even get coaches who teach your guests how to play games. You can reach out to us anytime by phone or email and get a prompt response. We know how important constant communication is when you’re planning a party, and we want to save you stress, not add more! What’s stopping you? Book your next event with GameTruck LA, and you’ll get the best mobile gaming party in the area. Whether you’re in Los Angeles or a surrounding city, we’ll come to you and make sure your party is unforgettable. Give us a call at 866-253-3191 or click here for a pricing quote.